The final space shuttle mission to service the Hubble Space Telescope ended Sunday when Atlantis landed in California, a safe conclusion to a dramatic flight that prepared the iconic observatory for a new revolution of discovery. For the second straight day, persistent unfavorable weather conditions at the Florida spaceport prevented shuttle Atlantis from returning from space. NASA decided to keep Atlantis aloft an additional 24 hours in hopes for a break in the weather at Kennedy Space Center for touchdown at 10:11 a.m. EDT on Sunday. MISSION STATUS CENTER - live text and video! The Atlantis astronauts got a bonus day in orbit thanks to bad weather at the Kennedy Space Center that forced Mission Control to cancel Friday's landing opportunities in Florida. The shuttle remained in space and target a landing on Saturday. With the shuttle Atlantis in good shape and no problems with its protective heat shield, NASA managers Thursday released the shuttle Endeavour from stand-by duty for a possible launch on an emergency rescue mission. The Atlantis astronauts, meanwhile, pressed ahead with preparations for landing Friday, keeping tabs on threatening weather in Florida. As Atlantis' mission to Hubble winds down, we look back to the shuttle's launch with footage recorded by video cameras on the solid rocket boosters. The movies are presented here for Spaceflight Now Plus users with launch audio. Astronomy's iconic orbital observatory -- the Hubble Space Telescope -- was deployed by the space shuttle Atlantis astronauts Tuesday after a dramatic five-spacewalk servicing that should allow the spacecraft to continue probing the mysteries of the Universe for several more years. The Atlantis astronauts performed their fifth and final spacewalk Monday, a seven-hour excursion by John Grunsfeld and Drew Feustel that equipped Hubble with a second fresh battery pack, a refurbished fine guidance sensor and new thermal insulation panels. It's expected to be the last time any astronauts will touch the space telescope. Held up by a stripped screw, spacewalker Mike Massimino applied brute force muscle power to an otherwise delicate operation, breaking off an offending handrail and then carefully unscrewing more than 100 small fasteners to get inside a dead science instrument aboard the Hubble Space Telescope. A spacesuited astronaut cut through shielding on a broken camera deep inside the Hubble Space Telescope Saturday, removed a cover plate that wasn't designed to be taken off in orbit, used a custom tool to pull out four blown circuit boards and then installed a fresh set. And before that, the crew installed a state-of-the-art instrument designed to study the large-scale structure of the universe. Astronauts Mike Massimino and Mike Good went outside Atlantis for an extended 8-hour spacewalk Friday to swap out the Hubble Space Telescope's six stabilizing gyroscopes - the top priority of this servicing mission - and three of its aging batteries, now operating at half their original capacity. The Hubble Space Telescope, hobbled by old age and years of post-Columbia neglect, was plucked out of open space by the crew of the shuttle Atlantis Wednesday, setting the stage for a final five-spacewalk overhaul to give the iconic observatory an extended lease on life. A lengthy heat shield inspection by the Atlantis astronauts Tuesday found a patch of nicked tiles, apparently damaged during launch by a debris impact. But after additional analysis, engineers concluded the minor damage would not require any additional "focused" inspections. With a second shuttle on standby for possible rescue duty, the shuttle Atlantis blasted off Monday on a high-stakes five-spacewalk mission to resuscitate the aging Hubble Space Telescope, a fifth and final housecall to give the hobbled satellite a new lease on life. The Hubble Space Telescope has cost U.S. taxpayers some $10 billion in the quarter century since the project was approved. But to astronomers around the world, the high-flying satellite is, in a word, priceless. In late April, astronaut Mike Massimino completed the final underwater simulation and described it as "an historic day," coming more than 25 years since the start of such space suited training sessions for Hubble mission crews. It was equally poignant for Spaceflight Now's Craig Covault, who had performed one of the first such Hubble tests. The shuttle Atlantis' countdown is proceeding smoothly toward launch Monday on an $887 million mission to service the Hubble Space Telescope, with forecasters now predicting a 90 percent chance of acceptable weather in Florida and only a slight chance of showers near an emergency runway in Spain. The seven space shuttle astronauts arrived at the Kennedy Space Center shortly past 5 p.m. EDT Friday, an hour after the three-day countdown began for Atlantis' planned Monday launch to service the Hubble Space Telescope. When the space shuttle Atlantis blasts off on NASA's final mission to service the Hubble Space Telescope, the shuttle Endeavour and a four-man crew will be standing by for launch on a mission space agency managers hope will never be needed: an emergency rescue flight to bring the Atlantis astronauts back to Earth if heat shield damage or some other problem prevents a safe re-entry. NASA's fifth and final mission to service and upgrade the Hubble Space Telescope will add one of the most dramatic chapters yet to an ongoing saga that reads like "The Perils of Pauline." Or an over-the-top Hollywood screenplay about a scientific superstar repeatedly rescued from the brink of disaster. With retirement of the space shuttle program expected next year after just nine more flights, NASA's managers Thursday announced the first major round of job losses, saying 160 contractor workers would face layoffs Friday, the first of up to 900 jobs that will be lost between now and the end of the fiscal year. The announcement came following an all-day meeting that approved plans to launch Atlantis on May 11. The launch date for shuttle Atlantis on the final servicing mission to the Hubble Space Telescope has been moved a day sooner than originally planned. NASA has formally set May 11 as the new target, with a liftoff time of 2:01 p.m. EDT. A one-and-one-eighth-inch socket from a torque wrench fell from a service platform and hit the shuttle Atlantis' left payload bay door radiator during Hubble Space Telescope cargo installation earlier this week. In a lucky break for NASA's shuttle team, no one was injured, coolant lines in the radiator were not damaged and a dent where the socket impacted will not need repairs. This video retrospective remembers the birth of Hubble. Space shuttle Discovery successfully delivered NASA's Hubble Space Telescope into Earth orbit in April 1990. The observatory opened a new window on the universe, revolutionizing our understanding of the cosmos. NASA managers are debating whether to move up launch of the shuttle Atlantis one day, from May 12 to May 11, to get as many launch opportunities as possible before standing down to make way for a military operation that requires support from the Air Force Eastern Range starting May 14, officials said Wednesday. For the final time in space shuttle program history, both launch pads at Kennedy Space Center are occupied. Endeavour was rolled to pad 39B before sunrise last Friday, taking its perch a mile-and-a-half north of pad 39A where Atlantis stands poised for the last mission to service the Hubble Space Telescope. These panoramas shot Friday show Endeavour at dawn and the mid-afternoon spectacle of seeing double shuttles. Following through on its extraordinary plan to have a quick-response space shuttle poised to launch if the Atlantis crew needs rescuing during next month's Hubble Space Telescope servicing mission, NASA rolled sistership Endeavour to the other Kennedy Space Center pad Friday morning. Even factoring in a recent satellite collision, an analysis of the threat posed by space debris at the Hubble Space Telescope's 350-mile-high altitude shows the crew of shuttle Atlantis, scheduled for launch May 12 on a mission to service the observatory, will not face a dramatically higher risk of potentially catastrophic damage. Facing a tight budget, a 2010 deadline to end space shuttle operations and a lack of concrete political support to fund additional flights or stretch out the current manifest, NASA managers are meeting this week to discuss the impact of ending efforts that have been keeping open the option of extending the shuttle program past the current deadline. In preparation for its role as a standby rescue craft during next month's Hubble Space Telescope servicing mission and its scheduled June construction flight to the international space station, shuttle Endeavour rolled from the hangar to the Vehicle Assembly Building on Friday morning. The space shuttle Atlantis, bolted to a mobile launch platform atop an Apollo-era crawler-transporter, was hauled to launch pad 39A at the Kennedy Space Center Tuesday for work to ready the ship for blastoff May 12 on a fifth and final mission to service the Hubble Space Telescope. Ground crews moved the space shuttle Atlantis out of its hangar at the Kennedy Space Center Monday. The orbiter was transported to the Vehicle Assembly Building for attachment to an external fuel tank and twin solid rocket boosters. Atlantis will be rolled out to launch pad 39A next week to begin preparations for liftoff May 12 to service the Hubble Space Telescope. NASA managers met Thursday and agreed to press ahead with plans to launch the shuttle Atlantis as early as May 12 on a final mission to service and upgrade the Hubble Space Telescope. But officials deferred a decision on whether to require use of launch pad 39B for a potential emergency rescue mission and what impact that would have on the Ares 1-X test flight schedule. NASA officials Thursday cleared shuttle Endeavour for launch to the space station on Nov. 14 and also scrapped the possibility of Atlantis flying the final Hubble Space Telescope servicing mission next February, saying the additional time needed to ready replacement electronics for the observatory will push back the launch window until at least May. Engineers believe they understand what caused isolated problems during restart of the Hubble Space Telescope's science instruments last week in the wake of an earlier electrical glitch. They have successfully restarted Hubble's B-side payload computer, officials said Thursday, and hope to bring the first of the telescope's major science instruments back on line this weekend. After a weekend of troubleshooting, engineers at NASA's Goddard Space Flight Center have not yet pinned down the cause of two glitches last week that prevented restart of the Hubble Space Telescope's science instruments, officials said Tuesday. With its flight to the Hubble Space Telescope postponed until next year, space shuttle Atlantis rolled off its launch pad Monday and is now safely inside the Vehicle Assembly Building. Work to switch the Hubble Space Telescope to a backup science data management system after a component failed last month has been interrupted by a pair of on-board glitches during the restart process, officials said Friday. After two weeks of engineering reviews and discussions, NASA managers have decided to press ahead with plans to put the Hubble Space Telescope into electronic hibernation Wednesday to carry out what amounts to long-distance neurosurgery. Shuttle program managers are now targeting Nov. 14 for launch of the Endeavour on a space station repair and resupply mission. No target dates have yet been set for shuttle Atlantis' launch on a now-delayed flight to service the Hubble Space Telescope, but it appears the earliest possible launch slot is mid February. A critical equipment failure aboard the Hubble Space Telescope on the eve of a long-awaited fifth and final shuttle servicing mission put astronomical observations on hold and forced NASA managers Monday to delay the mid-October flight of Atlantis, likely until next February or even later. FULL STORY - updated @ 8:25 p.m. Shuttle program managers Wednesday ordered minor, expected delays for the next two shuttle missions - an October flight to service the Hubble Space Telescope and a November space station assembly mission - primarily because of training time lost in the aftermath of Hurricane Ike. Atlantis commander Scott Altman said today his crew lost a week of training time because of Hurricane Ike, "so you come to the question of either slipping the launch or cutting out events." The Atlantis astronauts are reviewing emergency procedures at the Kennedy Space Center before participating in a dress-rehearsal countdown Wednesday. Launch on a high-profile mission to service and upgrade the Hubble Space Telescope remains targeted for Oct. 10, but sources say the flight is expected to slip a few days because of training and hardware processing issues. The astronauts to service the Hubble Space Telescope next month flew into Kennedy Space Center on Sunday afternoon for this week's countdown dress rehearsal and emergency training drills at launch pad 39A. For a few hours on Saturday morning, a true rarity occurred for NASA's space shuttle program as both Atlantis and Endeavour were fully visible on their Kennedy Space Center launch pads with the rotating service gantries open. Trouble with a purge system connected to a canister housing fresh batteries and a new camera bound for the Hubble Space Telescope somehow blew insulation into protective bagging around the cargo carrier, officials reported late Wednesday. Work to inspect and clean the canister will delay its delivery to the shuttle Atlantis at launch pad 39A by at least 24 hours. After an intense summer of long hours and tight schedules, ground technicians packing the new science instruments and equipment for launch to the Hubble Space Telescope are nearing the finish line. See our collection of panoramas that show space shuttle Atlantis traveling from the Vehicle Assembly Building to launch pad 39A for the October mission to extend the life of NASA's Hubble Space Telescope. NASA on Friday formally pushed back the target launch dates for shuttle Atlantis' servicing mission to the Hubble Space Telescope and Endeavour's logistics run to the space station. The space shuttle that will make the fifth and final servicing call on the Hubble Space Telescope was rolled to the launch pad Thursday for its October mission to extend the life and vision of the famous observatory. NASA scrapped Tuesday morning's planned rollout of space shuttle Atlantis from the Vehicle Assembly Building to launch pad 39A due to the looming threat posed by Hurricane Hanna. Troubles getting the liquid hydrogen umbilical connected between space shuttle Atlantis and its external fuel tank inside the Vehicle Assembly Building has delayed the rollout to launch pad 39A. After spending four extra days parked inside its hangar while Tropical Storm Fay poured on the Kennedy Space Center, shuttle Atlantis finally moved to the Vehicle Assembly Building on Friday night in preparation for its October launch to the Hubble Space Telescope. Space shuttle program leaders met Thursday and discussed a proposal to move up the target launch dates for the next two missions in October and November. But in the end officials decided to leave the Hubble servicing mission and space station flight as originally scheduled on Oct. 8 and Nov. 10. Space shuttle program managers Friday modified an official "change request" that, if approved, will move up the next two shuttle launchings by three days each, not six as initially requested. NASA has unveiled a revised manifest for the final 10 flights in the space shuttle program, reflecting previously forecast delays across the board because of post-Columbia external tank safety upgrades that have stretched out deliveries. But shuttle Program Manager John Shannon said he's confident NASA can complete the space station and retire the shuttle fleet in 2010 as planned. NASA Administrator Michael Griffin has approved a fifth and final shuttle mission to service the Hubble Space Telescope. The flight will extend the observatory's life by replacing aging parts and increase its scientific reach by installing two new instruments. 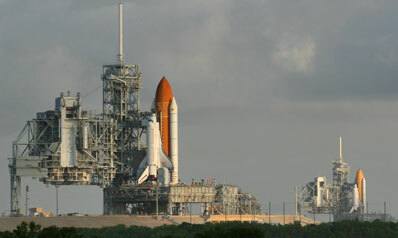 Launch is tentatively planned for May 2008 using shuttle Discovery.